A little while ago, I was contacted by indie nail brand Julisa. They asked if I would be interested in swatching some of their nail polishes, and after taking a quick look at their selection, I quickly agreed. I chose three shades and felt that I would share my best mermaid nails with you all. A little bit about the brand first - Julisa is a brand run by two sisters and they create 5-free, cruelty free, vegan friendly nail polish. They are also locally made on the Gold Coast in Queensland, and they also donate 5% of their profit towards environmental sustainability initiatives. These were big factors in me falling in love with the brand right away. I picked three shades; Blood Moon, Ghost Cactus and Midnight Eyes. 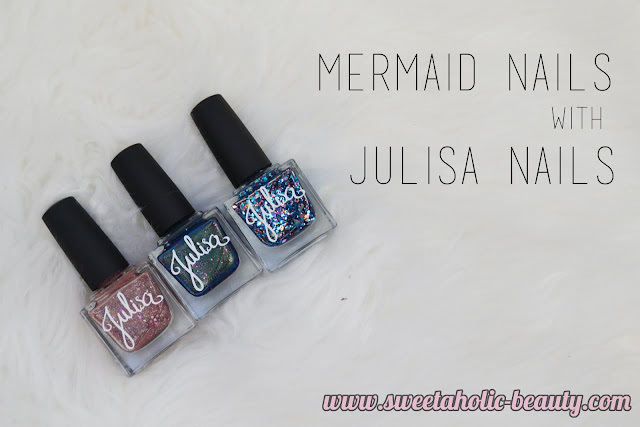 If you do have a look at their website, they are very beach themed and magical looking, so I was reminded a lot of mermaids when I was browsing the shades. I also chose glittery polishes as I do tend to gravitate towards glitter. All swatched with three coats and Seche Vite top coat. Oh how I loved these polishes even more once I swatched them. I was so impressed with the all around quality of these polishes. The bottle, the shades themselves and the application was all incredibly professional and could easily be mistaken for a high-end brand. I honestly can't choose a favourite as I love them all to bits. Both Blood Moon and Midnight Eyes look stunning alone, but also gorgeous as top coats on other manicures - so don't be surprised to see these gorgeous ones again on my nails. Ghost Cactus was stunning alone, with just a hint of glitter, could also be used as a gorgeous base to add more glitter. Although these polishes were provided to me, I can assure you that my ravings are true. I will definitely be picking up more shades, whilst praying that they release more glittery shades for me to fall in love with, too. Please check out their gorgeous website, too. 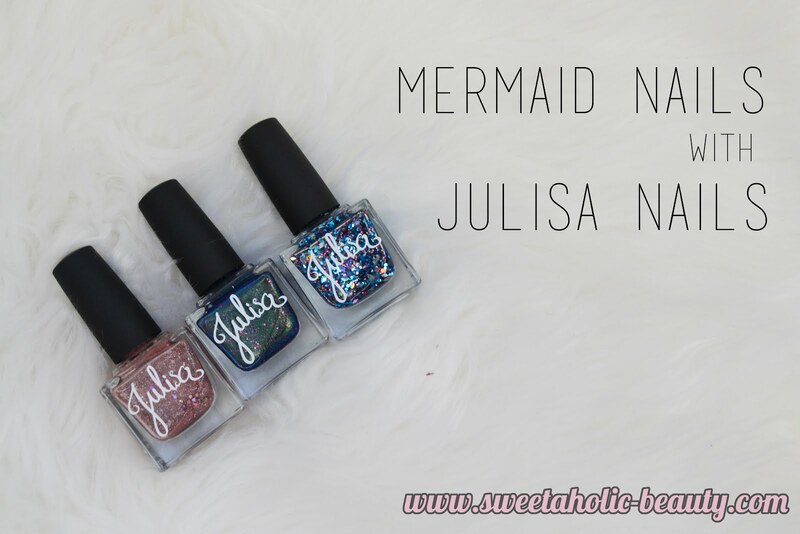 I adore the Julisa Nail Polshes. Have you tried them before? If so, what are your thoughts? Which shade is your favourite? Products in this post were provided for consideration. Wow, these look super pretty! I'm loving the extra glittery Midnight Eyes. What fun polishes! I've never actually heard of this brand before but those polishes do look so lovely and girly. I think Ghost Cactus looks like such a lovely and dynamic hybrid shade. Gah! How gorgeous are these! And the shape of your nails... Beautiful! These all look so pretty, I really like Blood Moon & Midnight Eyes. I love learning about new Australian brands such as Julisa. I've never outgrown my glitter and shimmer phase (and I hope I never do)! Ghost Moon looks amazing! Pops I meant Ghost Cactus. I am so obsessed with these nail polishes! I need midnight eyes in my life!!! I just ordered three and I love them all. I really like your nail shape too!